There are not many stars left from the 1930s, and one of the most beautiful was/is Mary Carlisle. Mary is 101 now. Born in Los Angeles, California, she starred in several B movie-grade Hollywood films in the 1930s, having been one of fifteen girls selected as "WAMPAS Baby Stars" in 1932. Mary Carlisle was born as Gwendolyn L. Witter on February 3, 1914 in Los Angeles, California. Her mother was Leona Ella Witter (née Wotton).Being born into a religious family, she was educated in a convent in Boston. Her father died when she was four years old. Leona Witter later remarried, to industrialist Henry J. Kaiser.Carlisle and her mother then relocated to Los Angeles, where her uncle lived. He gave her the opportunity to appear in the Jackie Coogan vehicle Long Live the King in 1923. Carlisle married actor James Edward Blakeley (1910–2007) on March 14, 1942, who later became an executive producer at 20th Century-Fox. Carlisle retired from films shortly after getting married. The couple had one child during their nearly 65-year marriage. In her later life, she was in charge of the Elizabeth Arden Salon in Beverly Hills, California. On February 8, 1960, aged 46, she received a star on the Hollywood Walk of Fame. With the deaths of Gloria Stuart (1910-2010) and Barbara Kent (1907-2011), Carlisle became the only surviving "WAMPAS Baby Star". In later years Mary kept active in current events, and was a glamourous reminder of a forgotten era. She attended a convention honoring Bing Crosby in 2003, and she remained active in Beverly Hills charity events. Other info says she was born in Boston. Mary is 104 now and how amazing is that! 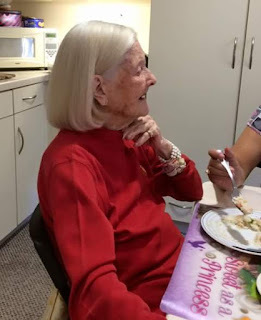 The California Birth Index at https://www.californiabirthindex.org/birth/gwendoly_l_witter_born_1914_284231 states that she was born in Los Angeles County. I have many pictures of her and James. They were wonderful friends of mine. RIP James and Mary.